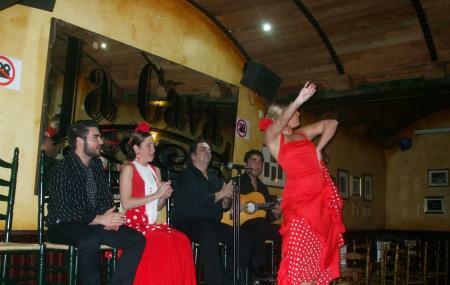 For great food and authentic Spanish hospitality and entertainment, head over to La Cava Tabrena Flamenca! It is a traditional tavern with a distinctive flamenco feel to its decoration and furnishings. This is the place to be for an evening full of fun, food and drinks. Flamenco performances are conducted at night, generally between 9:30 pm to 11:00 pm. Love this? Explore the entire list of places to visit in Cadiz before you plan your trip. Fancy a good night's sleep after a tiring day? Check out where to stay in Cadiz and book an accommodation of your choice. How popular is La Cava Taberna Flamenca? People normally club together Museum Of Cadiz and Castle Of San Marcos while planning their visit to La Cava Taberna Flamenca. The most amazing flamenco dancing, the performers are completely absorbed in the moment, very dramatic singing and wonderful guitar playing. The seats are close to the stage. Reasonable food and drinks Go for the experience. First time seen live flamenco and really loved the performance. Dancers were passionate and obviously loved their dancing. Tapas simple but sufficient. Mind blowing. Flamenco at its finest. Nice food, efficient staff. Have been a number of times with different groups of friends and everyone has thoroughly enjoyed it. Highly recommended.